Looking for a quick commute during rush hour? Dream on. Trying to flag a taxi in the middle of a rainstorm? Forget about it. Wuhan is a huge city where traffic and transportation can be a real nightmare. So how can we get out and enjoy this lovely city as smoothly as possible? Luckily for us, Wuhan’s metro line 2 is now operating in full effect! Next time you’re itching to get out, you should check out these places of interest along the metro line. 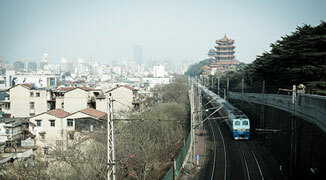 Wuhan 1911 lies near the Hankou Railway Station and is a nice area with a selection of restaurants and coffee shops. Hit up Zoo Coffee for a morning pick-me-up and a breakfast of waffles, or try one of their deli sandwiches for lunch. Next, stop by Salut International to purchase some imported goods including skincare, household necessities, beer, and a variety of dry/canned foods and snacks. You can finish off the day at Noi, Wuhan’s first authentic Italian restaurant and lounge complete with an Italian/American owner and staff. Noi is also partners with a local cultural club called Global Minds, so be sure to ask about it when you go! There’s nothing better than enjoying a rainy day at the museum. Next time the weather ruins your outdoor plans, stop by the Wuhan Museum to check out their exhibits and artifacts. The rain might even clear up while you’re exploring the city’s history and culture, giving you a chance to check out the beautiful Houxianghe Park located just outside the museum. If luxury shopping is what you’re yearning for, then Wuhan International Plaza is the place to go. The basement level of this shopping center features a supermarket called Lifestyle Experiences, probably the most foreign-friendly grocery store you will find in Wuhan. A stroll along Wushang Road, located behind the shopping plaza, will reveal a vast selection of local food vendors that are particularly well-known for breakfast. Of course, a trip through this metro station would never be complete without a visit to its namesake, Zhongshan Park. The Wuhan International Convention and Exhibition Center is located in the area as well. At the Xunlimen Station, a transfer can be made to the elevated light rail (line 1). After transferring to line 1, you can head northbound to the Huangpu Road Station to visit Wuhan Tiandi for American-style donuts at Daylight Donuts, or indulge in a double-scoop waffle cone at Baskin-Robbins. Heading in the other direction will bring you to the Chongren Road Station where you can sip traditional Chinese teas and engage in late-night conversation with friends at the Wuhan Tea Market. If you’ve been in Wuhan for any length of time, you’re most likely familiar with the plethora of stores located along Jianghan Road, including the expansive pedestrian street and bustling night market that is open for business seven days a week. If it’s Sunday and you find yourself in the Jiyuqiao Station, try heading over to the Westin Wuhan for their Bubbalicious Sunday Brunch. Looking to catch up on a little reading in your native language? Stop by the Hubei Foreign Languages Bookstore to take a look at their selection to find a cure for your literary craving. Take a trip to the Baotong Temple situated almost entirely on a hillside and tucked away behind trees. This classic Chinese Buddhist temple features two large iron bells that date back nearly 900 years. After you’ve finished in the temple, you can dine at one of the nearby vegetarian restaurants. If you’re in need of electronics, this is definitely the place to go! Computer Town has more gadgets than you could ever possibly need. If you’re looking to save a little cash, check out the secondhand electronics market located inside of Computer Town for even more bargains. This area is also home to the sports university, so you can visit one of the many sports equipment retailers for all of your athletic needs as well. [Travel agencies ] China International Travel Service (Wuhan) Co., Ltd. Sounds great, has it opened? Anyone know what the prices are out in the Helens cafe. Like the french fries or having some shots !!! A single milkshake for 20RMB, isn't that kind of steep, I bet the rest of food is not the same prices !!! pikk Commented on China International Travel Service (Wuhan) Co., Ltd.